Instilling good oral hygiene habits as your children grow can help lead to a lifetime of better teeth and fewer cavities. It can even affect their overall health. As a parent, of course, you want to give your child the best start possible. But where do you begin? You’ve got questions about pediatric dentistry, and we’ve got answers. Here are 4 frequently asked questions about pediatric dentistry. 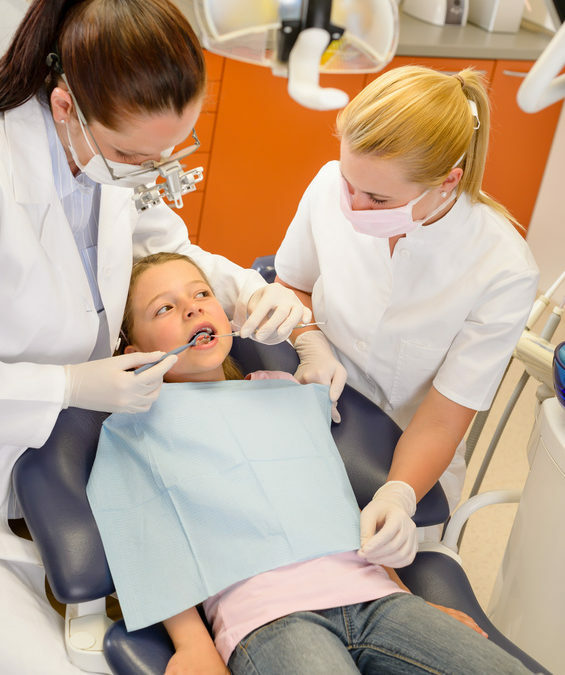 When should I bring my child in for their first dentist visit? The American Academy of Pediatric Dentistry advises that your child see the dentist soon after their first tooth emerges or between 6 months old and one year. Their first visit will be more about getting acquainted with the dentist office. They’ll check for any abnormalities with the gums, palate, and jaw. The dentist will also be able to answer any questions you may have about caring for your toddler’s new teeth. Typically, it’s recommended that your child has a dental checkup every six months. Depending on your child’s oral health (extensive cavities, abnormalities), more frequent visits may be necessary. What types of food should I avoid feeding my child for better dental health? Cavities are caused when bacteria in our mouths come into contact with sugars left behind in our mouths after eating. With this in mind, making healthy choices in foods and drinks for your child is important for good oral health. Limit sodas and juices, and offer water instead. Avoid gummy sweets and be sure to have them brush their teeth well after having sugary treats. Eating a variety of fruits, vegetables, and healthy proteins help your child develop strong, healthy teeth. If you have specific questions about how diet affects dental health, make a note to ask the dentist at your next appointment. A pediatric dentist is essentially a pediatrician for your child’s mouth, with specialized training for caring for children’s mouths. A family dentist cares for the whole families’ mouths. They handle tiny toddler teeth to geriatric grins and everyone in between. A family dentist, like Murfreesboro Family Dentistry, will care for your whole family. This can be helpful in developing a healthy dentist relationship with potentially wary little ones. Have more questions about caring for your child’s dental health? Make an appointment with Dr. Jackson at Murfreesboro Family Dentistry today!